TOURNAMENT SCHEDULE Twin Oaks Sports Complex in Frank Anneberg Park was built in 1987 and is once again the premier sports complex for softball and baseball tournaments in the region. Recent improvements include synthetic turf installed on four softball/ baseball infields at Twin Oaks Complex (Fields 1-4) and at Field 1 at Anneberg Soccer Complex. The project also included energy-efficient sports lighting on four softball fields and two soccer fields. We provide Manhattan, Wamego, St. George and Junction City with reliable and on-time service. Call us today! 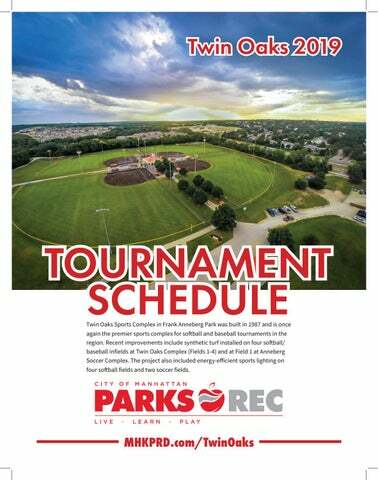 Anneberg Park/Twin Oaks Sports Complex 2019 Tournament Schedule NO PETS & NO ALCOHOL ALLOWED INSIDE TWIN OAKS! Manhattan Spring Slam – BB USSSA/MSP 8U-14U Aggieville Classic Showcase - SP USSSA M&W Sat Wildcat Classic – FP USSSA/MSP 8U-14U CLOSED – HAPPY MEMORIAL DAY WEEKEND! *All Registered Teams get a free ticket to KSU Baseball Game at Tointon Family Stadium! 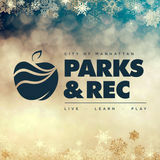 **Possible Friday Games ***All Rostered Players get a free Zip Line at Manhattan’s Wildwood Outdoor Adventures!